The Free People brand comes from the same brains as Urban Outfitters, with a cool and slightly boho aesthetic that has seen the label rocket in popularity. It is aimed at young women who want to express both individuality and fashion sense and the lines include clothing and accessories, from jeans through to headbands. The hosiery range is both practical and fun, with ruffled thigh high socks alongside cozy socks and colored tights. There are tights with exciting printed designs, leg warmers and ballet socks, as well as slipper socks and anklets. 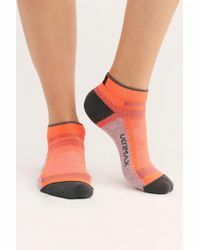 Footless tights, sports socks, shoe liners and every day opaques are also part of the range.